The Radnor Hunt Concours d’Elegance 2010 will be held September 10-12 on the grounds of Radnor Hunt, outside of Philadelphia in rural Malvern, Pennsylvania. 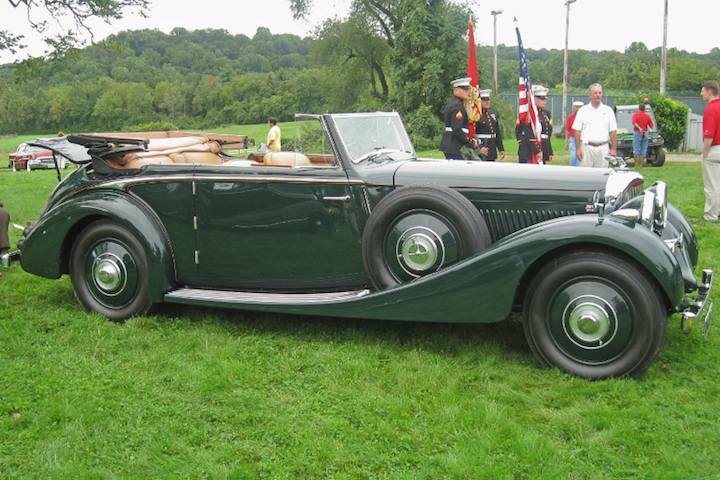 The 14th annual Radnor Hunt Concours will featured cars from Studebaker, the coachwork of Pininfarina and a selection of vintage Triumph motorcycles. A display of vintage coaches and carriages makes a return appearance at this year’s event. The Radnor Hunt Concours d’Elegance 2010 encompasses three days of activities beginning with the Friday evening Porch Barbecue, the Saturday morning Road Rally through the scenic countryside of Chester County and the Saturday night Black Tie party featuring a silent auction to benefit the charities. Each year, the Concours event, an invitation-only classic car show, has a featured marque, a vehicle type or coachbuilder and a motorcycle make. The 2010 Radnor Hunt Concours d’Elegance will feature a selection of significant cars from Studebaker, one of America’s earliest auto manufacturers, which traces its roots to building horse-drawn wagons in the late 1800s. Some of the Studebaker vehicles that will be on display include a 1906 Series G Touring Car and a 1931 President Roadster, both significant models in the company’s history. The featured coachbuilder this year is Pininfarina, a name associated with many of the most beautiful Italian cars, in celebration of the design firm’s 80th anniversary this year. Included in the selection of cars to be displayed are a rare 1932 Ford Model A with body by Pininfarina, a 1958 Lancia B24 Aurelia Spider and a 1966 Ferrari 365P which is one of two ever made. The show will also feature an additional category titled “Cars with Tailgates”, including a 1947 Mercury 79M Woodie Wagon and a 1955 Pontiac Safari Wagon. The motorcycle division will showcase British motorcycle manufacturer Triumph, one of which is a 1952 6T Thunderbird model, which many may recognize as a bike very similar to the one Marlon Brando rode in the classic biker film “The Wild Ones”. Other notable Triumph bikes to be displayed on the show field include a 1963 Bonneville TT Special and a 1970 T120 model. Legendary motorcycle racer Gary Nixon is a special guest at this year’s event. The Concours event, also known as the 100 Motor Cars of Radnor Hunt, takes place on the grounds of Radnor Hunt, outside of Philadelphia in rural Malvern, Pennsylvania, a beautiful setting for an event of this type. The one hundred vehicles are carefully picked by the car selection committee to ensure that the field of entrants is best representative of the featured marque or vehicle type. The motorcycle committee also selects the proposed entrants based on the originality and rarity of that model. This year will mark the third appearance of vintage horse-drawn carriages and coaches at the Concours d’Elegance to illustrate the evolution of both transportation and coachwork. The carriages will process from the grounds of the Devon Horse Show to Radnor Hunt on Sunday morning, and be on display during the afternoon of the Concours. Other activities on Sunday include the parade of the Radnor Hunt Hounds, a vintage aircraft flyover and a presentation of the colors by a Marine Color Guard. Proceeds from the event benefit the Joan Karnell Cancer Center at Pennsylvania Hospital and Thorncroft Equestrian Center. The Joan Karnell Cancer Center provides progressive, comprehensive and supportive cancer care through a wide range of services. Their mission is to offer an interdisciplinary approach to diagnosis, treatment, research and education to help cancer patients and their families achieve the best quality of life. Thorncroft Equestrian Center has horseback riding programs designed to educate equestrians of all ages and abilities in the enjoyment and care of the horse. For more information about the Radnor Hunt Concours d’Elegance, visit www.radnorconcours.org.